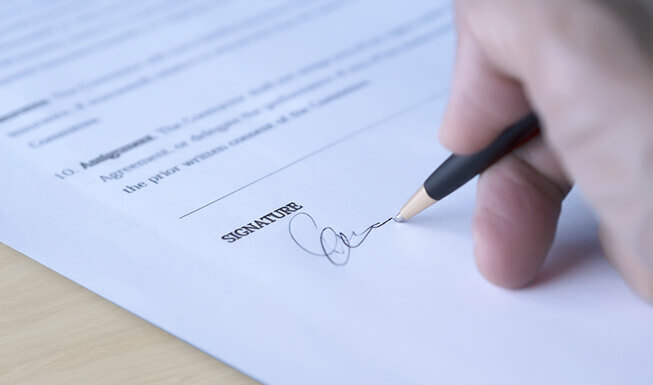 A power of attorney form, or "poa" is a legal contract that is used to give another party "the agent" authorization to act on behalf of someone in affairs relating to legal matters. These legal matters may include financial, medical, and guardianship issues on behalf of the individual creating the power of attorney. Additionally, a durable power of attorney means that the agent can continue to act even if the individual can no longer make decisions. A POA is required to be signed according to state laws in order to be in legal effect. A durable power of attorney is a legal document that uses the same terms as a general power of attorney. The person who is giving the power is the principal. The person who will hold the power will either be referred to as either the agent or as the attorney-in-fact. It still gives power to the agent to act on behalf of the principal. The difference between a durable power of attorney and other forms is that if the principal becomes disabled or incapacitated in some way, the agent would still hold power--it doesn’t end. However, if you want your power of attorney to be durable and for your agent to continue to have power if you become disabled or incapacitated, make sure that your power of attorney explicitly states that it is durable. That one word makes all the difference. With a general power of attorney, one person (known as the principal) gives permission to another person (usually referred to as the agent or attorney in fact) to manage their assets and financial affairs while the principal is still alive. The agent can be given the legal right to do anything that the principal has the ability to do. So, the agent could pay bills, control a checking or savings account, sell real estate, make decisions related to stocks or retirement accounts, and more. Because this legal document grants the agent substantial power, it’s important for the principal to list out clear instructions about what the agent can and cannot do. For a general power of attorney to be activated, the principal should have legal capacity to enter into this agreement. This means that the principal must be over the age of 18 and be able to understand what it is that they’re doing by entering into this agreement. With a general power of attorney, a clause can be added to end the power of attorney within a certain time frame. Additionally, if a problem arises, the principal has the ability to revoke the power of attorney at any time (as long as they still have the legal capacity to make that decision). The power of attorney would end in the event of the principal’s death or when the principal becomes incapacitated. This form should be used when you require an individual to represent before the IRS. If you have ongoing legal proceedings with the IRS, it is best to utilize Form 2848 to allow an experienced tax attorney and/or accountant to present and negotiate the case on your behalf with the IRS. As mentioned in the previous section, a limited power of attorney and a special power of attorney are essentially the same thing. However, we’re going to discuss it in greater detail here. A limited power of attorney involves the principal granting specific powers to the agent. These powers are explicitly mentioned in the limited power of attorney. Therefore, while the agent may be given permission to access a checking account to pay the monthly expenses of the principal, they may not have permission to make decisions related to medical care or retirement accounts. Both a limited and a special power of attorney are limited for the purpose of handling certain affairs on behalf of the principal because the principal is unavailable to unable to do it for some reason. A common reason someone would use this type of POA is if the person were leaving the United States for a specific period of time and intends on returning. If the principal becomes incapacitated or dies, a limited power of attorney will cease to be valid. A medical power of attorney is more commonly referred to as a health care power of attorney (HCPOA). It uses the same terms of principal and either agent or attorney-in-fact. You’ve probably noticed that under the other POAs we’ve discussed that those typically end (with the exception of a durable power of attorney) if someone becomes incapacitated. With a medical power of attorney, you’re creating a legal document that gives someone permission to make medical decisions on your behalf if you’re unable to do so. It’s important to note that you don’t have to be terminally ill, involved in a high risk occupation or activity, or elderly to use this document. Your agent will have the ability to consent, refuse, or withdraw medical treatment, services, or procedures on your behalf. A special power of attorney is another name for a limited power of attorney. With this type of power of attorney, the principal is giving the agent or attorney-in-fact the power to make decisions on their behalf, however, it is done so under certain circumstances. These circumstances must be clearly explained in the power of attorney. The principal can also specify the power that the agent has. For instance, the agent may have permission to access the bank account of the principal to pay his or her expenses, but the agent may not be given the power to sell real estate or possessions of the principal. If the principal becomes incapacitated or dies, a special power of attorney will no longer be valid. The person authorized to make decisions is known as the agent or the attorney-in-fact. The party who is authorizing the agent or attorney-in-fact is referred to as the principal, donor, or grantor. The power of attorney form allows the agent or attorney to make financial decisions, gifts of money, health care decisions, or even guardianship decisions. The person who is representing the grantor may be entitled to receive payment for their services as an agent. However, the agent may also be a family member, such as a spouse, adult child, family friend, or another relative. 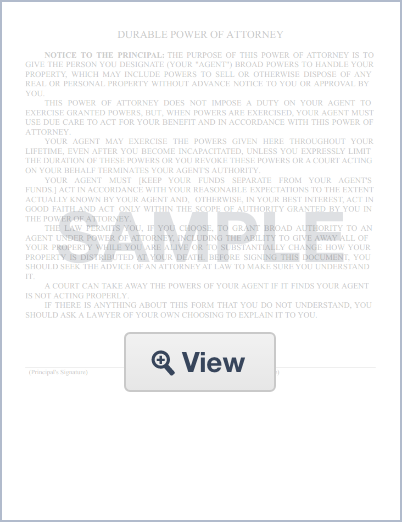 A power of attorney form serves as a legal definition of the powers granted the agent. This can either serve as authority to deal with a specific issue, such as critical care treatment, or the power to handle all of the principal’s affairs. The former is called a “specific power of attorney” and the latter is called a “general power of attorney.” We will explore these two types, as well as other types of power of attorneys later in the guide. Create a free Power of Attorney in minutes with our professional document builder. A power of attorney is an important legal document that appoints someone to make decisions your behalf. When you make your own power of attorney, it must comply with the laws in your state. However, that doesn’t mean that it’s a difficult process. Follow these easy 5 steps to create your own power of attorney. First, review the different types of power of attorney documents available. Some are revocable and some aren’t. Also, think about your actual needs. Do you need someone to make medical decisions? Do you need someone to handle your personal affairs, such as paying your monthly expenses? Do you want or need someone to buy or sell property or make business decisions? You can even list out exactly what your agent can and cannot do. Depending on the state you live in, your agent may be referred to as an attorney-in-fact. This person will receive legal authority to make decisions on your behalf as outlined within the POA. Make sure that you choose someone who is trustworthy and responsible. This needs to be someone you know will make decisions in your best interest and who won’t abuse their power. You may also list a secondary agent. This person will assume the position if your first agent cannot or will not take on the responsibility. Now that you have your needs in mind and you’ve chosen at least one person who will act as your agent when the time comes, it’s time to complete the document. This is quite easy to do, but it’s important that you use one that is written to comply with the rules in your state. Then, edit the document by filling in the blanks. You’ll need to use your own personal information as well as personal information of your agent. Within the document, you will likely be referred to as the Principal. Properly signing the document is how it becomes a legally binding instrument. Depending on the state you live in, you may need to sign it in front of two witnesses and a notary. It’s also likely that your witnesses cannot be named as your agent. Keep the original and also make copies. Many institutions will not accept a photocopied version. Since there are organizations and institutions that will not accept a photocopy, make sure that you keep the original document in a safe place. Make sure that your agent knows where the original may be found. What’s the Difference Between a General Power of Attorney and a Durable Power of Attorney? With a general power of attorney, the powers granted to the agent end if you become incapacitated or if you die. A durable power of attorney is a document that allows the agent to retain their power even if you are incapacitated. A durable power of attorney can be extremely valuable if your agent has the ability to make medical decisions on your behalf or if that same person is named as your agent in a living will. What Is the Procedure for Signing a Power of Attorney? The procedure and requirements for signing a power of attorney varies slightly in every state. Generally, your named agent must be at least 18 years old. Your agent may not act as a witness during the signing process. In most states, there’s a requirement for the signature of the Principal (you) to be witnessed. 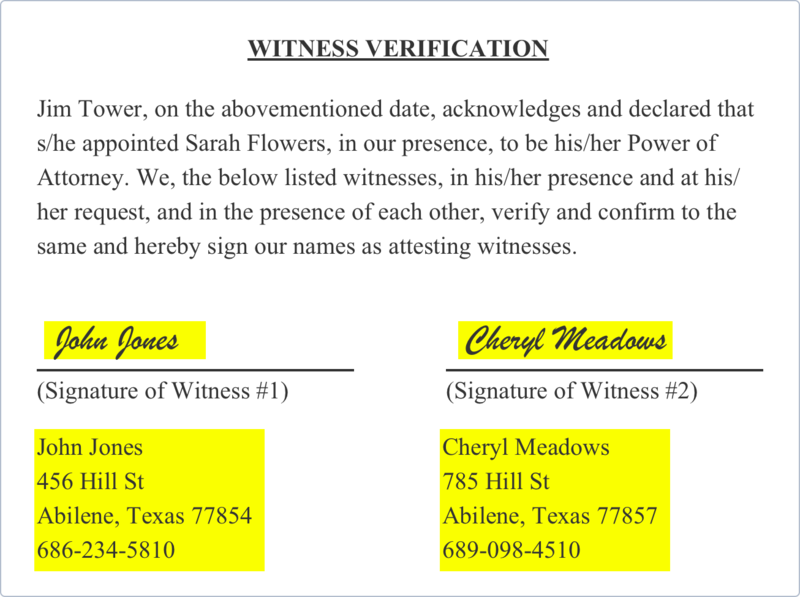 The most common witness requirement is two witnesses. Some states require that the document be signed in front of a notary. Why Should You Use a Power of Attorney? Sometimes, a person may need a legal guardian or a conservator. The purpose of a legal guardian or a conservator is to protect those who cannot make their own decisions. It could be because they have a mental illness, a developmental delay, the inability to communicate due to a medical condition (such as a stroke), or because of an issue such as dementia that often comes with an advanced age. While guardianship is usually given to a family member or friend, if one isn’t available, the court can appoint a total stranger to make those decisions. There are horror stories of elderly and disabled people being taken advantage of and physically and financially abused. Completing a power of attorney to handle your medical decisions and your financial and personal decisions before the likelihood that you need a guardian can help prevent this sort of abuse. With a power of attorney, you can elect someone that you know (and trust) to make financial, personal, and medical decisions on your behalf. You can choose to make your power of attorney durable so that it will still remain active if you become unable to make your own decisions. When Should You Use a Power of Attorney? However, because your needs will change over time, it’s important to keep both your personal and medical power of attorneys up to date. Once it is signed, you can keep both a hard copy in your home and store a copy online. Remember that these documents are important because it means that the court doesn’t have to make these difficult and often sensitive decisions for you. While the courts mean well, their time is limited and there’s always a chance that your wishes will not be honored if they’re not written down in a formal and legal matter. Also, keep in mind that a power of attorney is a private process. It’s between you, the agent, a couple of witnesses (most likely), a notary (in most states), and maybe an attorney. It’s not put on file with the court (although you and your agent should have copies). Yet, it is still private because it remains within your inner circle. With a guardianship or a conservatorship, you’re dealing with a public record that is created by the court. This means that anyone can go to the court and pull copies of the documents because they are considered public record. If you value your privacy, you may consider power of attorney documents for personal, financial, and medical elections instead of allowing the court to make those decisions on your behalf. How to Deal with Potential Consequences Ahead of Time? Something else you must do is to reassess your power of attorney on a regular basis. People get married. They get divorced. They change their names. They change their minds. They move away. There are lots of things that can happen that could cause a complication in the future when the power of attorney is actually needed. For instance, if you name your adult child as your agent and you use their first and last name, although they go by their middle name, they may not be able to act as your representative and access your accounts if their identification lists their middle name as their main name. So, make sure that you word your power of attorney in a way that will help your agent take action on your behalf. For instance, if you name John Edward Doe as your agent, but he goes by Eddie Doe, then you’d want to word it as “John Edward Doe AKA Eddie Doe” or in some other comparable way. This doesn’t just make it easier for your power of attorney to access your accounts (or accountant if you have one), but it also cuts down on a potentially lengthy and expensive court case. If you are a person of substantial means, make sure that your agent knows where all of your money is kept. 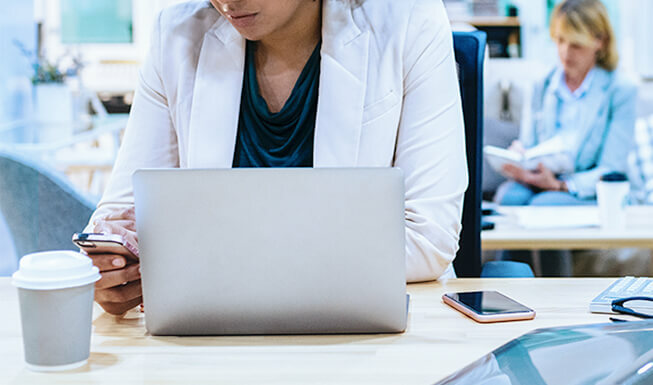 Although you will certainly need to have the utmost trust in your agent, it also ensures that the care you need, be it medical, legal, or some other form of help can be paid for from your accounts with ease. What is the Importance of a POA for Personal and Business Reasons? There are a number of reasons why it may be beneficial for a caregiver to have the legal authority to handle financial, personal, and business affairs of an elderly loved one. Certain physical ailments can make it difficult to go to the bank, write out checks, or even see a computer screen to pay bills online. Hearing loss can also make it difficult to pay bills over the phone. Much like a medical power of attorney, a general or durable power of attorney shouldn’t be entered into without the principal understanding of exactly what it is that they’re doing. The principal must have the legal capacity to consent, and should also clearly understand what the agent can and cannot do. For instance, the agent may have permission to pay bills online, write out checks to pay bills, and even to do the necessary shopping. Business decisions may also be delegated. However, agents may also be given the legal ability to buy and sell personal property or real estate on behalf of the principal. This is why it is so important for the principal to understand what the agents can and cannot do on their behalf. Because of the amount of power that can be given, it is important that principals understand and really know who they’re signing this power over to and they should never sign out of distress. Not everyone is honest and will act in the best interest of the principal once they have legal access to make these financial decisions. It can sometimes result in abuse or neglect. If you suspect abuse or neglect by someone who holds a power of attorney as a caregiver, contact adult protective services in your area. What is the Importance of a Medical POA? As a caregiver, you may be taking care of someone who has an illness that will get worse over time. With a medical power of attorney, you’ll have the ability to make medical decisions on behalf of your loved one. A medical power of attorney is very helpful even if your loved one is in the beginning stages of a debilitating physical or mental illness. 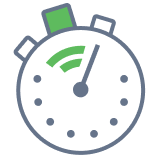 This important document gives you the ability to make appointments on their behalf. Keep in mind, though, that a medical power of attorney must be entered into while the principal is in the proper state of mind. They must be able to understand what they’re signing and how it affects them. If you are considering naming an agent to make medical decisions for you, make sure that it is someone you implicitly trust. This person will have the power to make treatment decisions on your behalf. This also includes end-of-life decisions. You should also consider completing an advanced healthcare directive to express your wishes to your medical care team. How to Use a POA as a Caregiver? Your loved one needs to have the mental capacity to understand the power that they’re giving you. Your loved one may need more than one type of power of attorney. If your loved one wants you to have the ability to continue to take care of their affairs if they are physically or mentally unable to make those decisions, you need to discuss the importance of using a durable power of attorney. Understand that regardless of which power of attorney you have (or even if you have one for personal and business affairs and one for medical decisions) that those will expire when the principal dies. You will not necessarily be the one in charge of their estate (unless they’ve named you as the administrator in their will or other estate documents). What is the role of a POA in Immigration? There’s a lot of attention given to immigration right now. Parents who came to the United States either illegally or overstayed their visas and gave birth to children while still in the U.S may be in danger of being deported. Because of this, many parents concerned with deportation have turned to power of attorney documents to give a trusted friend and citizen the permission they need to take care of their children. In the case of a parent worried about deportation, a power of attorney can be drawn up to give a trusted friend or family member the legal authority to make school, medical, and other important decisions on behalf of their children. Some parents worry that signing a power of attorney giving someone else the ability to make decisions for their children will strip them of their rights of a parent. Keep in mind that power of attorneys can be written with a trigger that puts the authority into motion. Yet, because a power of attorney is a legal document, someone who may want to use it to ensure that their children are taken care of should understand what they’re signing and should seek out qualified legal advice to make the best decision for them and their children. One of the highlights of choosing a power of attorney over legal guardianship is that parents signing a power of attorney do not have to appear in court. What are the Components of a Power of Attorney Form? No one likes planning for worst-case scenarios, but it’s a worthwhile task. As mentioned above, power of attorney is a form that passes the power to make life-changing decisions from you to another individual. It’s a way of estate planning that prepares for disasters such as extreme illness, traumatic or fatal accidents and psychological instability caused by age or mental illness. The content of a POA form varies wildly from situation to situation. See below for a breakdown of the components of the main types of forms. When it comes to making medical decisions on your behalf, you’ve already learned in this guide that most power of attorneys will end if you become incapacitated or disabled in some way. Though cumbersome, it is often easier to have two power of attorney documents: one for your personal and financial decisions and then one for your medical needs. What is the role of an advanced directive? It’s also important for you to consider an advanced directive or living will. The purpose of an advanced directive or living will is to explain to your family and medical team what your wishes are, related to your care. This is important because you need your family (or closest friends) and your doctor to carry out your wishes related to medical treatment, when treatment should be halted, your end-of-life decisions (such as a Do Not Resuscitate or to withhold food and liquid), and anything else that you want people to know regarding how you’d like your medical needs and wishes met. This helps clarify to your agent and your medical team what you want and how they can proceed to honor your wishes. Another important reason to separate your financial/personal power of attorney from your medical power of attorney has to do with the agent. The person you name to make your financial and personal decisions may not be the best person to make your medical decisions. They may not feel comfortable doing it, or they may not feel like it is their place make those decisions. Therefore, when you separate out these issues into two power of attorney forms, you can name two separate agents to carry out their respective duties. What is a Durability Provision? If you become somehow mentally incompetent, due to old age, sickness, accident or other cause, and you want a general power of attorney form to go into effect, you should need to sign a durability provision. This provision essentially puts your POA into effect on your behalf should you be unable to make that decision. Be sure the durability provision dictates that you must be pronounced mentally incompetent by a medical professional, and not just a friend or family member. What are the Legal Considerations of a POA? How do you enter into a POA? Now that you understand the basic differences between power of attorney documents, you need to understand the basics of entering into one. First, of course, you need to choose one that best fits your needs. Remember, if you want or need someone to remain able to make specific decisions for you if you become disabled or incapable of making your own decisions, you need to make sure that your power of attorney specifies that it is durable. After you’ve chosen the right type of POA for your needs, think about the powers that you want or need your agent to have. Make sure that you explain it very, very clearly. This helps protect you and ensures that your agent understands what you need from them. Your power of attorney should meet any criteria laid out by the state. POAs are state-specific. That is, they must meet certain rules of the state for the document to be legally enforced. For instance, the principal must be over the age of 18 and they must have the legal capacity to enter into the agreement. The agent must be over the age of 18 and have the legal capacity to enter into the agreement. In many states, a power of attorney must be notarized. You wouldn’t sign the power of attorney until you were in front of a notary public. Some states also require that a power of attorney form have witnesses. Most of the time, the agent cannot also act as your witness. You’ll need two people who are over the age of 18 who will witness your signature. Sometimes, the POA must be witnesses in front of the notary as well. Who should be chosen as an agent or attorney-in-fact? While there’s not necessarily a right or wrong way to choose an agent, there are certain individuals the principal may want to consider first. A spouse, an adult child, an adult niece or nephew, an adult sibling, or a trusted friend can act as an agent. The important part, as stated in the last section, is to make sure that the person you've chosen truly has only the best interest of the principal in mind. What responsibilities does the agent have in upholding the tenets of a general POA? 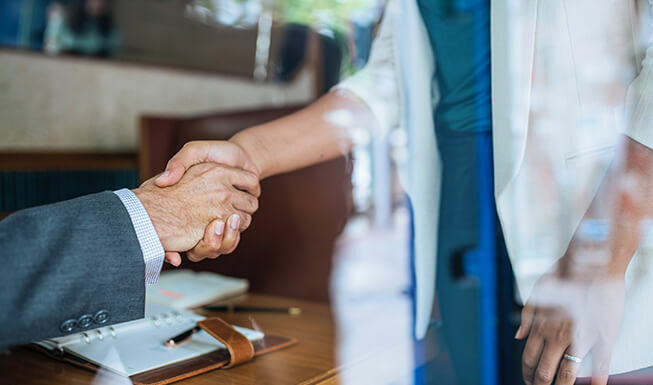 To ensure the agent adheres to the agreement, he or she must keep complete records of all actions and transactions made on the principal’s behalf. He or she must also verify, at the start of the agreement, that he or she fully understands all the terms outlined and both the extent and the limits of his or her responsibilities. Does an agent receive compensation? Agents are sometimes paid. Because of this, the principal and the agent should agree on an amount in advance. If the principal doesn’t pay as agreed, the court can determine how much should be paid. When it comes to choosing an agent, the power of attorney should include some specific language that obligates the agent to keep accurate records related to the powers granted to them as well as how those powers are exercised. The power of attorney should also include a limit on gift giving by the agent as well. You should have one primary agent and one or two backups listed on your POA, just in case something tragic happens to Agent #1. If you happen to be in possession of considerable wealth or extremely jealous friends, choose your alternative POA agents wisely. You don’t want to turn your life into a Dickens novel by pitting rival confidantes against one another. What makes a POA Legal? To ensure no wrong has been done on your behalf while your POA is in effect, make it a provision of the POA that the agent(s) must keep a complete record of all transactions and decisions conducted under your name. This means distributing several copies, all signed by you and a notary public. A POA cannot go into effect if it is not certified. How Does a POA Work with a Trust? Sometimes, people decide to work with an attorney to create a trust of some sort (one of the most common is a revocable living trust). A trust can be used for many purposes. A power of attorney can work with a trust, but the power that your agent or attorney-in-fact will have will ultimately depend on the jurisdiction in which you live. If you don’t have a trust, you may want to consider one, not only to protect your assets but also provides tax benefits. However, even if you don’t think that a trust of any sort is in your best interest, you should keep in mind that your named agent or attorney-in-fact may think otherwise. Check with an estate attorney in your state to find out if the person you name would have the power to set up a trust of some sort on your behalf. Even if you don’t have a trust, the information in the next section is important for everyone to know. We’ve already discussed some of the things that your agent or attorney-in-fact can do with regard to your trust. So how do you make sure that your trust is used only in the way that you want it to be used? Well, aside from appointing someone who you truly believe has your best interest at heart, you should ensure that you clearly list out what your agent or attorney-in-fact can and cannot do in regards to your trust. How Do You Terminate a POA? To terminate a power of attorney, you must send a letter, also known as a revocation form to your current power of attorney. 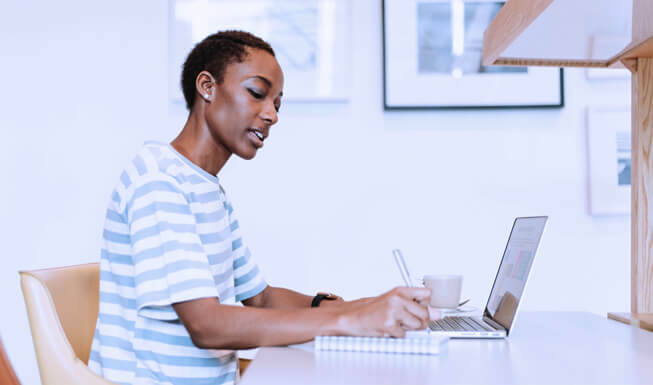 Since these are not legal letters that must be filed in court, a specific format is unnecessary, however, it is important that your revocation letter is clear and exact. For that matter, many libraries, legal aid services, and legal websites offer blank forms you can fill out. Once your form is filled out, you must take the completed document, along with two witnesses to a notary public. It’s wise to write “revoked” in large dark letters at the top of the document. Once the document is signed by you and your witnesses in the presence of a notary public, be sure to send your revocation letter to your current POA, along with all banks, institutions, and health care providers who are aware of your current POA via certified mail with return receipt. This gives you proof that they all have received the revocation letter and you may save the returned receipts as proof. 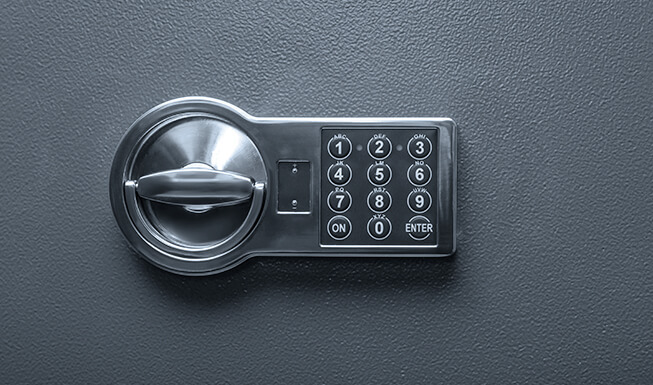 How do you protect yourself as a consumer? Whether you’re choosing a power of attorney because you’re going overseas with the military or because you need help making your financial, business, or medical decisions, you must make sure that you protect yourself as a consumer. Remember that the purpose of a power of attorney of any sort is to help you pay your bills and make your decisions. As briefly mentioned, someone can end up not having your best interest at heart. As a consumer, you should know that abuse of a power of attorney can take place in many forms. After reading and understanding the aforementioned clauses, sign and date the agreement, certifying that you are granting permission to your Agent to handle financial and legal affairs on your behalf should you become unable or incapacitated. Provide your name, and the name and contact information of your Agent. This should include your Agent’s full name, address, and county where he or she lives. Keep in mind that your Agent must be at least 18 years of age and be of sound mind. A power of attorney is a powerful and serious legal step you may take to ensure that your wishes are fulfilled when it comes to your affairs, your health, and your end-of-life decisions. It is an important step that will end confusion, neglect and potential abuse should something unfortunate happen to you or a loved one. By now, you should have an understanding of the different types of a power of attorney, and when each situation is useful. Disclaimer: The above content is provided to you as an informational product. It is not legal advice. You receiving and/or reading this document does not in any way constitute an attorney-client relationship. In fact, you should understand that power of attorney forms are state specific. Because they are state specific and they can be very powerful documents, you should talk with an attorney in your area to ensure that you’re choosing the right one for your needs. Use this guide only as an educational device. Make a list of questions and consult with a licensed estate attorney. A Power of Attorney is a legal form. It can be used in many situations. This document is used to name another person who has your permission to handle your legal, business, and personal affairs because you are either out of the country or you are unable, mentally or physically, to make those decisions. A Last Will and Testament is a legally enforceable document that sets out how a person wishes their assets to be distributed after death. Without this document or signature, property and wealth will be distributed by the courts and may be contested by interested parties, such as family, business colleagues, or other acquaintances. A Living Will legally enforces health care providers to carry out your specific wishes in relation to medical treatments, surgery, or withdrawal of treatment in the event of your incapacitation. It can include values and quality of life decisions. This protects loved ones from second guessing your wishes and the potential for disputes to arise at a difficult time. A Health Care Proxy is also known as 'Medical Power of Attorney'. It empowers you to appoint a trusted representative to make decisions about your health treatments in the event of your being unable to do so. It also allows you the added protection of discussing your wishes and values in advance with someone you can rely on.